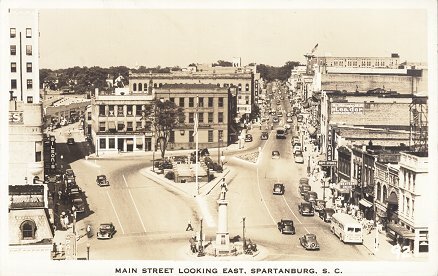 A very brief look at the town of Spartanburg while the Camp was in existence. Spartanburg was a town very accustomed to a military presence. There were more battles and skirmishes in the county during the American Revolution than in any other county in South Carolina. The city and county allegedly took its name from the Spartan Regiment raised in the area during the Revolution. During the War Between the States, South Carolina furnished more men, in proportion to its male population, than any other Southern state and Spartanburg District supplied more than any other county in the state. Immediately after the war, Union troops from the 7th US Cavalry, under Captain Reno, occupied the town and at some point burned the courthouse. During the first World War the town hosted Camp Wadsworth, a National Guard training camp (and one of the largest in the country) where the 27th division, 28th division, 369th regiment, and others trained before going overseas. personnel lived in town and remember it as a friendly community.